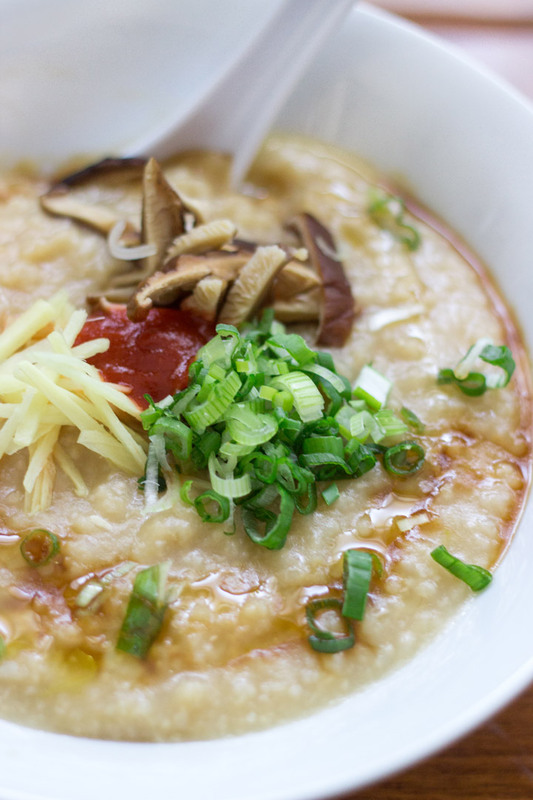 Congee (also known as jook) is the ultimate Chinese comfort food, an everyday rice porridge often eating at breakfast but also served to people when they are ill. Warm, comforting, and filling, the core of congee comes from humble origins as it was intended to make a little bit go a long way. Just 1 cup of rice cooked down could serve up to 8-10 people and was accompanied by little bits of meat, fish, or anything leftover from the night before. It’s like the never-ending pot of chili that can serve many a hungry mouth no matter who shows up. Traditionally, congee on it’s own is rather plain – just rice cooked with water or perhaps chicken bones – while the seasoning is left up to each person at the table. In our version, we add a significant amount of flavor by cooking the rice in chicken broth (or vegetable broth to make it vegetarian) along with ginger, garlic, scallions, and dried mushrooms. A simple drizzle of soy sauce and sesame oil at the end makes this an endless bowl of comfort. This recipe is ultimately flexible as well. Use short grain, arborio, or even brown rice (just not basmati, it’s too delicate) and whatever combination of liquid you can put together just as long as the ratio is 1 part rice : 10 parts liquid. Add more or less of anything according to your taste. Every family has their own way of making congee, and now you will too. In a large bowl, rehydrated all of the dried shiitake mushrooms by covering them with boiling water. Allow to sit for 20 minutes. In a large pot, add the rice, broth, salt, garlic, ginger, and scallions. Remove 8 of the shiitake mushrooms from the hot water and add to the pot. Add 1 cup of the mushroom soaking liquid to the pot. Drain the remaining mushrooms and slice them into thin strips for garnish. Set aside. Bring the pot to a boil then lower to a simmer. Cook, stirring every 15 minutes, until the rice breaks down and thickens into a porridge, about 1 hour if you like a thinner consistency and 1 1/2 hours for a thicker consistency (which we prefer). If you find that the congee is becoming dry before the rice breaks down, add a splash of water or broth to loosen. Add the 1 tablespoon soy sauce and 1 teaspoon sesame oil. Remove the whole scallions and slices of ginger. Leave the garlic and whole shiitake mushrooms. To serve, serve each person a bowl of the congee and lay out all of the accompaniments so everyone can add to their liking. Or, if you want to serve each person individually, to each bowl add a small pile each of sliced mushrooms, ginger, and scallions. Drizzle with 1 teaspoon each of sesame oil and soy sauce and add a small dot of hot sauce if desired. Vijay, looks delicious! In the Japanese version (ie “okayu”) we use iwanori, which is a thick concentrated seaweed paste. A good punch of flavor (maybe umami too? ), as I find the taste is sometimes too subtle for me without it. I love this porridge. I’ve been making this recipe for years, but never tried it with shiitake or garlic. I’ll add them next time. Great recipe! Great to hear! Hope you enjoy it! Hello chef..I would like to prepare this for my baby and he is 10months old. Is it okay if I don’t add the ginger as I’m afraid that he may not be able to take the taste. How do I prepare the chicken broth ? Would you mind sharing me the recipe please? Thanking you in advance.